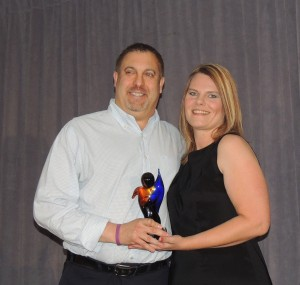 Hortons Wins the 2015 Humanitarian Award from Industry Leader Lighting One! 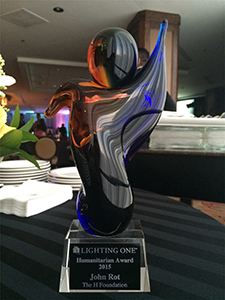 We are proud to announce Hortons Home Lighting won the 2015 Humanitarian Award from Lighting One for our dedication to The H Foundation, a charity we co-founded that supports basic science cancer research. The mission of The H Foundation has united the entire lighting industry, with support from other local retailers, to manufacturers and retailers across the country. Many donate products, money and promotional services for both The Foundation and the Goombay Bash. Lighting One also supported a 50/50 fundraiser at their annual conference to support The H Foundation. They raised a full pot of $1,690, all of which was donated to the foundation, thanks to raffle winner Crystorama Sales and Marketing VP Ryan Ranzino immediately donating his winnings. Thank you for all the support we’ve received! If you’d like to join us as we continue our fight against cancer, why not attend the 15th Annual Goombay Bash on July 18? It’s the largest and most lively Caribbean-themed fundraiser in Chicago, and directly supports The H Foundation!